Our new remote control "Fancy" is the last-born in our range and, although being the cheapest one, its technical features make it useful for a lot of applications. 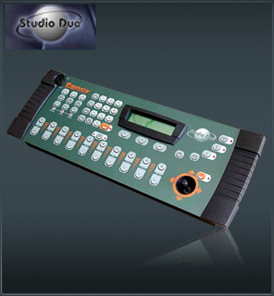 The dynamic menus and the advanced editing functions make Studio Due Fancy Controller 512 very simple to use: simple and clear menus are always shown on the LCD display, and the detailed error messages help the user in the fast and simple programming. controller thus enabling Studio Due Fancy Controller 512 to run any spot. • 1620 possible scenes with dynamic control of the memory. Scenes stored on a FLASH memory. • Advanced editing functions of the scenes ( possibility of programmes fusion, copy scenes, programmes).